'Marvels: The Remastered Edition' review: The modern classic returns to print – AiPT! If you don’t already have it, just buy it. What can you say about Marvels? People slag the ’90s for being a time of brainless excess and low artistic merit in comics, yet this amazing gem, almost too beautiful in both words and imagery to be real, dropped right in the middle of that maligned decade and captured the imaginations of even the edgiest of grimdark fans. Looking back on it though, as awe-inspiring as it was, Marvels was pretty damn dark, too. You would not want to live in a superhero universe for more than a minute, because that sh*t is crazy. Setting this story firmly in the realm of the Marvel citizen makes the book sometimes as unnerving as Watchmen even, as if the quick cameo by Night Owl and Silk Spectre analogues weren’t enough to point it out. Strangely enough, even though both of those landmark books were emblematic of their temporal settings, it’s Marvels, set mostly in a time long before its publication, that resonates more today. Issue #2, featuring the onset of the mutant scare, is a frighteningly accurate look at how average people can be whipped up into hysterical prejudice without even really knowing why, as clear an explanation as you’ll ever see for the Donald Trump era. 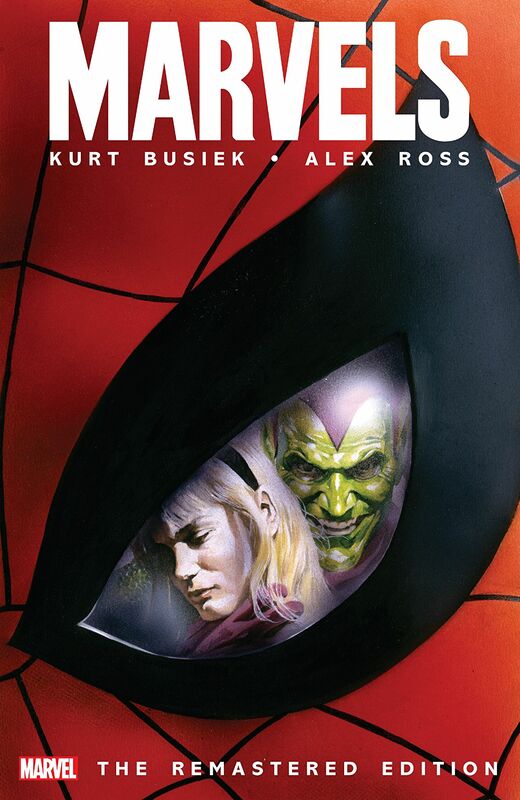 Fan-favorite writer Kurt Busiek’s use of language and slang from the early and middle parts of the 20th century is damn near historian-level in its verisimilitude, as is Alex Ross’ painted majesty of a growing New York City. Marvels is truly the pinnacle of comic book collaboration. But you know all that. Let’s talk about the extras in this newly-released, “remastered” paperback collection, which collects the four “proper” issues of Marvels, plus #0 featuring the original Human Torch. Sadly, it’s never explicitly stated what’s been “remastered,” and without checking, it’s hard to tell if the extras are new or were included in previous trade printings. Marvels: The Remastered Edition opens with a one-page introduction from Stan Lee (RIP), in typical boisterous fashion, but the sincerity in his admiration for the book is evident, and his insightful analysis shows what made Lee a great writer himself. It’s a rare look at genuine emotion from the perennial pitchman, clearly impressed with the creative team’s accomplishment and humbled that his characters could reach such heights. Probably the most valuable extra for serious Marvel-philes is a page of “sources,” which run down in which books all the newspaper headlines and events originally happened. There’s also a friendly dig from Understanding Comics writer Scott McCloud and a lengthy description of Ross’ process, from the man himself, including several of the photos he referenced while painting (including those of other artists and even his parents). Yes, in a book like this, the art is going to take center stage. There are also 24 pages of sketches, “character studies” and alternate covers. Marvels is one of most enduring comic books of the last 30 years, and Marvels: The Remastered Edition captures that (minus the fun acetate covers, of course). Who the hell knows where the remastering came in, though. The extras are of varying interest; McCloud’s congratulations to Busiek seems superfluous, while Stan Lee’s heartfelt thanks and Ross’ description of his tireless work are nice windows into the industry. They aren’t earth-shattering, but of course it’s the story itself you really want, if don’t have it already. It's one of the best single stories of the modern era, but the extras in this "remastered" version are hit or miss. What exactly is "remastered" here? McCloud's "extra" feels superfluous, and how much alternate art can you really look at?